Since 1993, our mission has been to provide professional, quality products and exceptional, personal service. We have enjoyed serving you for over 25 Years, and look forward to many more Centuries to come! Thank you for your Loyalty & Trust. I received exemplary service and a fantastic product. If you want to deal with an honest, personable, upstanding company, then go with Vampfangs. They’re consistently quick, personable and efficient. Makes me wish Vampfangs ran the Post Office, the DMV, the Federal Reserve and, for that matter, the U.S. Congress. I highly recommend them to my friends as well as anyone not only because their amazing products and items, but also their five star amazing customer service. From the murky darkness of a studio apartment in Historic Salem Massachusetts, a young entrepreneur lays the groundwork for what would become the world’s largest source for custom fit vampire fangs. The year: 1993. Vampfangs peddled fangs to small stores, door-to-door. They would set up a booth in Salem during Halloween to offer passersby a chance to have their own custom fit fangs. Customers clamored to become instantly transformed. “What else have you got?” was a common reaction. In the shadows of his mind, Vampfangs knew they were on to something. He also knew that the Gothic / Alternative / Vampire customer base was worldwide, and to reach it he need a worldwide approach. The internet. 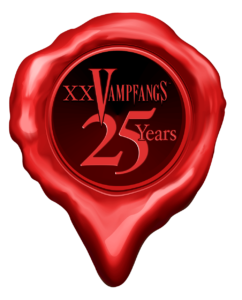 And thus, Vampfangs.com was born. Vampfangs has found incredible success by remaining innovative and always appealing to a wider range of customers. Today, Vampfangs has come full circle back in Salem with a new retail location on Essex Street! Contacting a support representative is easy! Use our brand new Trouble Ticket Support System! This is the fastest way to contact a customer support representative.